I survived my first experience as a convention guest at ConCarolinas! No, I more than survived: I loved it. I sold some books, picked up a couple of new followers on Facebook, Twitter and this blog and generally had a really amazing time discussing books and reading and my work. The panels I was on mostly went very well. There were a couple of other guests with whom I didn’t mesh well, but that’s life. I had the opportunity to meet many, many other authors who are simply fantastic people: supportive and enlightening and approachable and my nervousness disappeared basically from the moment I arrived. 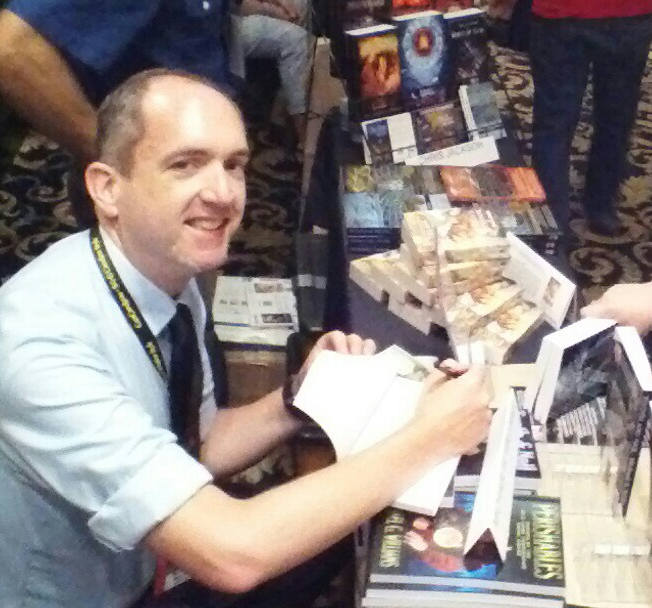 ConCarolinas was my first opportunity to do a number of things: sell a physical book to someone; sign a book for someone; and have a stranger walk up and say they wanted to read what I had written because of something I’d said. Not to blow my own horn, but it is incredibly gratifying to have someone say they like what I think about other things so they want my book. Being a convention guest is, it turns out, enormously good for one’s ego; or perhaps bad for it? It’s hard to say. Ego-stroking isn’t why I went, though. I went to network, to learn from others and to gain a little more exposure. I got all of those, and then some, and enjoyed myself while I did it. I can’t think of a better marker of success. Next steps for marketing Perishables and Tooth & Nail are to try to get a few physical copies into some local bookstores. This weekend or next I’ll be hitting up some of the local shops (Atomic Empire, Flyleaf, Chapel Hill Comics, maybe the Regulator – suggestions of Piedmont-area bookstores are most welcome). I’ll also eventually be trying to get it onto the shelves of Malaprop’s and – if they sell any fiction – Wyvern’s Den in Asheville. I’m also still trying to follow the philosophy that more works published means more sales of all works. As such, I have a short story called “The Several Monsters of Sainte-Sara-La-Noire” coming out in an anthology in September. I’ll be doing a promotional event with some of the other writers and the editor of that anthology on Saturday on Google+. I’m also working on a vampire short story called “Daddy Used to Drink Too Much” for an anthology being assembled by Sekhmet Press LLC. Janine K. Spendlove: Author of the War of the Seasons series of fantasy novels. She’s also a Marine Corps pilot, mother, athlete, artist and many other things. We bonded over being distance runners. Her cover art is beautiful and she is one of the smartest people I’ve ever heard discuss books and writing on a panel at a convention. She is also basically the best panel moderator ever. Chris A. Jackson: Author of numerous books and series, including Weapon of Flesh, the Scimitar Seas series of novels and Pathfinder Tales’ Pirate’s Honor (currently next on my to-read list). He was my table-mate in Author’s Alley. Chris is incredibly friendly, focused on all the right things – entertain people and have fun already – and he is an incredibly clever marketer. His ability to engage someone in conversation and flow in and out of topics is remarkable. I learned a ton just by sitting next to him for a weekend. A.J. Hartley: A.J. is a prolific, best-selling author and a Shakespearean scholar. He’s also just an incredibly friendly guy. Late on a Friday night we found ourselves watching a game of soccer/football and talking about the way he and I experienced sports growing up. He’s so nice, and he’s written everything from a very seriously literary novel of Macbeth to a fantasy series about an adventuring vagabond named Will. Jim Bernheimer: Jim was on the other side of me from Chris in Author’s Alley. Again, I learned a ton just by being near him for the weekend. He’s got an incredible gift for the elevator pitch stage of selling someone a book and he’s written across a broad swath of genres. Again, an incredibly nice guy and I was put very at ease by him, very early on.